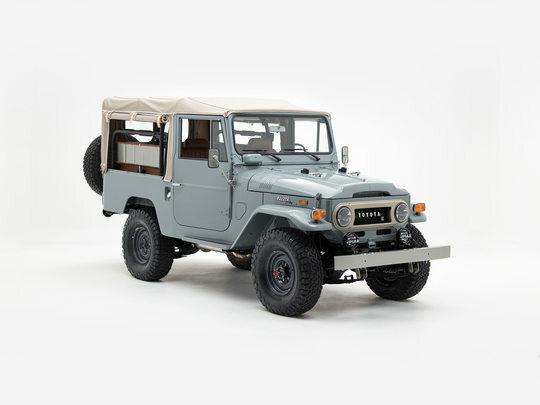 Imagine this FJ43 riding along the Pacific Coast Highway in Los Angeles. Side windows rolled up, ocean on the right, mountains on the left. Whether our client is driving to the grocery store, his office in Central L.A. or the California wilderness, one thing is certain - the fun is now in the getting there. Where did the word “cool” originate? Probably somewhere in Los Angeles, California — the land of surf, sand, and celebrities, where comebacks are staged, and dreams are made. But this town hasn’t seen a comeback like this. One that began with the steel body of the original, which was restored and painted it in Heath Gray (113). Its grille? Iconic. Its fenders? Flared. Its side mirrors, turn signals, and side markers? Early-style Land Cruiser cool. Completely revitalized, and ready to meet the world anew. The Land Cruiser was made to go anywhere, sandy beaches, backcountry trails, even L.A., at rush hour. That’s why this FJ43 was equipped with a modern powertrain that begins with an electronically-injected 1FZ engine and 5-speed transmission. It rides on versatile 33” all-terrain tires and features upgraded suspension by Old Man Emu, freshly-built front disc brakes, and our Advanced Power Steering — a combination that keeps this classic ride nimble, versatile, and 100% under your control. The cabin of this FJ43 brings in elements from the exterior, creating a ruggedly refined space. Typical of early Land Cruisers, the interior features an exposed metal dash and door panels which contrast beautifully with Silver interior accents and Tan vinyl trim. Doormats are custom-fitted to the floors, which were treated with a layer of RAPTOR liner to prevent scratches and wear. Look closely, and you’ll discover that we put all of your modern must-haves within reach: your favorite music, the perfect temperature, even your morning coffee. With a 1GR-FE engine and other modern upgrades, the G40 Expedition by The FJ Company is ready to own the road ahead. Customize yours!